In this video we will discuss CanDeactivate route guard in Angular. We will also discuss how to access angular template reference variable in component class. First let's understand, why route guards are required. Consider the following "Create Employee" data entry form. This is a pretty big form. Let's say you have filled 90% of the form fields and you accidentally clicked on the "List" navigation link. The application immediately redirects you to the "list" route and all your data on the "Create Employee" form is lost. Wouldn't it have been nice if there was an alert asking the user if he really wants to discard his changes and navigate away from the Create Employee form. A routing guard called CanDeactivate can help us achieve this very easily. The following table has the common routing guards and their purpose. We will discuss each of these routing guards with an example in our upcoming videos. In this video we will discuss CanDeactivate guard. There are 3 steps to use a routing guard in Angular. Building the route guard : A route guard can be implemented as a function or a service. In this video let's create a service. In our upcoming videos we will discuss creating a function. Create a new file, in the employees folder. Name it create-employee-can-deactivate-gaurd.service.ts. Copy and paste the following code. Since we are implementing the routing guard as a service, decorate the guard class with @Injectable() decorator. Since we want to implement CanDeactivate routing guard, make the guard class implement CanDeactivate interface. CanDeactivate interface supports generics. 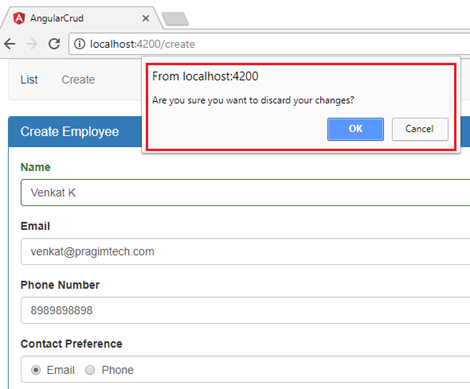 In our case, since we are creating a guard for CreateEmployeeComponent, we have specified CreateEmployeeComponent as the argument for the generic type of CanDeactivate interface. CanDeactivate interface has one method called canDeactivate(). Our routing guard class needs to provide implementation for this interface method. canDeactivate() method returns true or false. True to allow navigation away from the route. False to prevent navigation. If the component is not dirty we simply return true, to allow navigation away from the "create" route. @ViewChild() decorator provides access to the NgForm directive in the component class. employeeForm which is passed as the selector to the @ViewChild() decorator is the form template reference variable. The public property "createEmployeeForm" is used to check if the form is dirty. Register the guard with angular dependency injection system : Since the routing guard is implemented as a service, we need to register it in a module. At the moment we have only one module in our application and that is the root module AppModule. Import and register CreateEmployeeCanDeactivateGuardService in app.module.ts file using the providers property. Tie the guard to a route : Using the route guard, we want to prevent navigating away from the "create" route, so tie the route guard with the "create" route in app.module.ts file as shown below. At this point, if you try to navigate away from the "create" route when the form is dirty you get the alert as expected. The browser back and forward buttons also prevent the navigation away from the "create" route. is auth guard and route guard are same?